We are Colorado Parks and Wildlife (CPW). CPW is an enterprise agency, relying primarily on license sales, state parks fees, and registration fees to support its operations. This includes 42 state parks and more that 350 wildlife areas covering approximately 900,000 acres, management of fishing and hunting, wildlife watching, camping, motorized and non-motorized trails, boating, and outdoor education. CPW’s work contributes approximately $6 billion in total economic impact annually throughout Colorado. 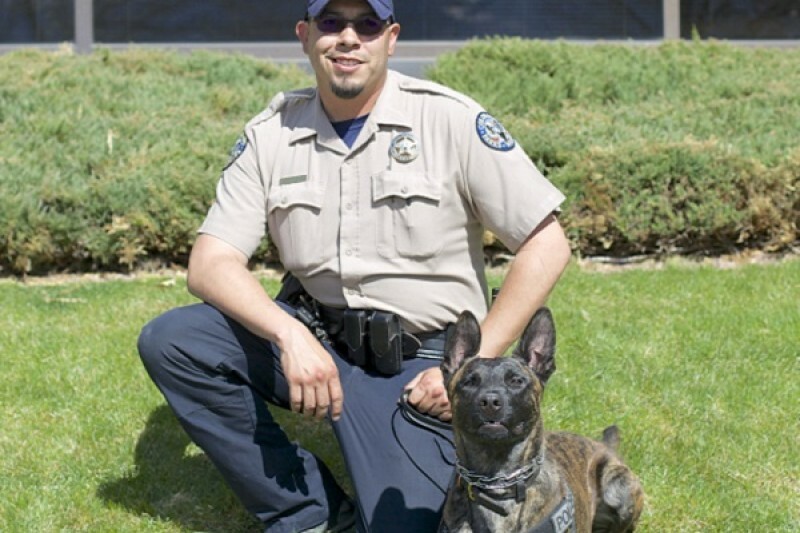 CPW is soliciting donations to support a police trained K-9 program. These dogs will be trained to help Officers locate animals, evidence, suspects, and protect the Wildlife Officers of Colorado. In addition, these dogs will help expedite investigations to help our Officers work swiftly and efficiently. The funds will support current and future training for the dogs. This includes: cost of food, boarding, veterinary services, and maintenance and training equipment. Colorado Parks and Wildlife thanks you for your generous donation. Sure, they'll tell you that I'm crazy; that they do indeed have the best job, but the truth is they're all jealous. You see, I'm very unique. My name is Sci and I'm one of just two dogs trained to do what I do in Colorado, and the fact is, the police dogs are so envious -- but also so proud -- they act like what I do is no big deal. But I see right through it. I am well trained after all. While they ride around all day in their air-conditioned cages, hoping, waiting, shaking for their chance to be of service, I'm out in fields or in the mountains making contacts. While they go to vacant buildings to keep on top of their scent training, I'm sniffing cars, trailers and campers ... sniffing for any sign that someone has illegally taken a resource that belongs to all of us in Colorado. Yeah, I got it pretty good, but I'm also extremely important. You see, the agency me and my handler work for is in the business of protecting Colorado's wildlife resources. For the longest time, a very small group of highly trained and specialized peace officers have tried to protect our state's big game, birds, small game and fish all by themselves. Anyway, wildlife managers cover a ton of ground -- Colorado does have a vast amount of public land that is open for recreation like hunting and fishing -- and it's pretty much a guarantee that nearly everyone they make contact with has a weapon. Can you imagine being high in the mountains, miles away from any services, without any cell coverage and having to make a contact with an armed person to check their hunting license or whether or not they might have poached something? Well, that's why I'm so special. And, I'm ready to protect him any time it's called for. I'm like the partner that has his back wherever, whenever, but instead of a yearly salary and benefits I get paid in play time, treats, good food and recognition. I do have some pretty good benefits too. My handler has worked with some awesome organizations to make sure my vet bills are covered. But even though I'm not taking home piles of cash for my work, this program is not cheap, and that's why I'm sharing my story with you. As I mentioned, I'm one of two dogs used by Colorado Parks and Wildlife, and by all accounts, Cash (the other dog) and I have been a huge success. So much so, that the agency wants to expand our program so that more working dogs can be a loyal and attentive partner to the men and women protecting our resources in the field. ... And they need your help to do it. That's why my handler set up this GoFundMe page -- to offset some of the cost of getting and training more dogs to do what I do, but for other wardens. I'm convinced that if this site accepted dog bones, we'd reach our goal in a matter of hours. (Those jealous police dogs would be so all over trying to get this gig.) But wouldn't you know, it doesn't. But you've got a good heart, right? You'd like to see more wardens teamed up with a partner like me, wouldn't you? I bet if your dog were reading this and had a credit card handy, you might have an interesting reaction to receiveing next month's bill. You don't have to be surprised. Consider this a bonding experience. Grab your dog and your credit card and make this donation together. I guarantee it will mean the world to your pup. You see, just like you probably pretended to be a policeman or a fireman when you were a kid, every pup dreams of having an important job like mine. Together, you can make that dream a reality for other loyal K9 partners. Contribute to this program now (before your dog does it after you've gone to bed) and feel AWESOME knowing you're helping great pups team with great people in protecting and preserving Colorado's amazing resources for you, and everyone else, to enjoy. In love with Colorado State Parks and the way they involve the public! I wanted to donate for such a wonderful cause! I am excited to see these great dogs helping CPW.